This volume brings together the work of leading scholars on two of the most important, yet puzzling, extant ensembles of Hellenistic Age sculpture: the Great Altar at Pergamon, with its Gigantomachy and scenes from the life of Telephos, and the Cave at Sperlonga in Italy, with its epic themes connected especially with the adventures of Odysseus. From Pergamon to Sperlonga has three aims: to update the scholarship on two important monuments of ancient art and architecture; to debate questions of iconography, authorship, and date; and to broaden the scope of discussion on these monuments beyond the boundaries of studies done in the past. In addition, the volume brings forward new ideas about how these two monuments are connected and discusses possible means by which stylistic influences were transmitted between them. "[The] contributors not only capture the extensive sweep and fascinating complexities of an international artistic style but also engage the reader in the accomplishment and sheer joy of collaborative discourse and scholarship." - Diana E. E. Kleiner, author of Roman Sculpture"
Nancy T. de Grummond is M. Lynette Thompson Professor of Classics at Florida State University and editor of An Encyclopedia of the History of Classical Archaeology (1996), among other books. Brunilde S. Ridgway is Rhys Carpenter Professor Emerita of the Department of Classical and Near Eastern Archaeology at Bryn Mawr College. She is the author most recently of Prayers in Stone: Greek Architectural Sculpture (ca. 600-100 b.c.e.) (California, 1999). 10. 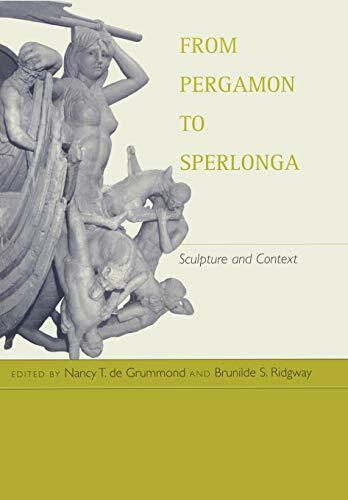 From Pergamon to Sperlonga: Sculpture and Context (Hellenistic Culture and Society) [Hardcover] de Grummond, Nancy T. and Ridgway, Brunilde S.